“Remember Mississippi”, a book about the Chris McDaniel’s 2014 campaign was released over the weekend. 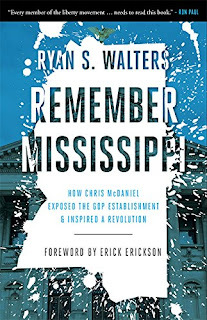 Ryan S. Walters, author and personal friend of McDaniel, takes his readers deep into the underbelly of the GOP’s “establishment,” and what we find there isn’t pretty. . . Incumbent Thad Cochran’s race-baiting, progressive-leaning, disinformation campaign against McDaniel culminates in perhaps the worst part of it all: a stolen election. Although most of my extended family is from the state of Mississippi, I was not intimately acquainted with the present political condition of the “most conservative” state until now. Not only is Mississippi ranked the most corrupt state in the union. It also takes more in Federal handouts per capita then any other state. The major reason for this incongruity has more to do with an out-of-touch political class than it does a supportive electorate. Halley Barbour’s political machine makes Boss Hog’s look more reality than fantasy, and ten times as bad! Warning: Reading this book may cause you to need a shower. At the same time, Walter’s remedy may offer hope! McDaniel accomplished something still causing reverberations within the establishment: He showed them for what they really were. His bravery in standing against a 6-term senator and subsequently exposing GOP corruption inspired grassroots conservatives to turn against establishment candidates during the 2016 presidential primary. McDaniel’s political career is not over, but Mississippi’s establishment has weakened. Constitutional conservatives need to keep standing up against immorality, gutter tactics, and corruption even when it exists in the Republican party. There is no better time than now. Remember Mississippi!